Over the last several years, manufacturers have embraced cloud applications. However, some manufacturers remain reluctant to migrate ERP systems and other business-critical applications to the cloud. Moving an ERP environment to the cloud enables IT leaders to free up the resources they need to partner with the business and to focus on more strategic technology initiatives. Download the white paper to learn more. 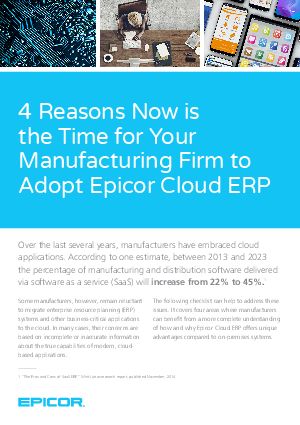 Download the white paper to learn more and discover why the best time to move to Epicor Cloud ERP is now.